Julie Butler, a Three Minute Thesis finalist, studies fish behavior in Karen Maruska's lab at LSU. Imagine you are a graduate student at LSU. Today, you are in an elevator, riding to the top of Choppin Hall or the Life Sciences Building here at LSU. Maybe a visiting professor you want to work for or the head of a scientific research funding body is on the elevator with you, and you have three minutes to tell them about your science research project, what it means and why it matters. Are you up to the challenge? Last week, over 40 graduate students across LSU’s campus took the ultimate test. Each student stood in front of an audience of peers, faculty and three judges, allowed only a single static presentation slide, and attempted to deliver an exciting talk about a research project that has been years in the making… in only three minutes! And this is only the beginning. The Three Minute Thesis (3MT) is an international academic competition, developed at the University of Queensland, that invites master’s and PhD students to present their thesis research and explain its importance in an engaging narrative delivered in non-technical language. A university-wide preliminary competition last week narrowed the field to nine students, who will compete in the finals on Wednesday, November 9 at 6 p.m. in the LSU Digital Media Arts and Engineering auditorium. The Graduate School is sponsoring the event, and the public and media are invited to attend. First and second places will win cash awards of $1,000 and $750, respectively. The audience will also vote to determine the winner of a $500 People’s Choice award. The first place winner will also receive the opportunity to represent LSU at the Regionals at the Conference of Southern Graduate Schools in March. Of the nine students who will compete in the finals of the Three Minute Thesis competition at LSU on Wednesday, five students represent the LSU College of Science: Joe Steiner from physics and astronomy, Misagh Naderi and Julie Butler from biological sciences, Richard Frnka from mathematics, and Siddieg Elsiddieg from chemistry. For a very special blog post today, we’ve asked Joe, Misagh, Julie, Richard and Siddieg to tell us more about their Three Minute Thesis experiences! LSU College of Science: Congrats on being a finalist in the Three Minute Thesis competition! What prompted/motivated you to be in this competition? What was it like, preparing an incredibly short talk about your graduate research project? Joe Steiner talks about his research on a new prostate cancer imaging device. Joe: I think it is very important to be involved as a graduate student, and so if I see opportunities like the 3MT competition, I take them. Opportunities such as this help me become more effective as a communicator, build my personal confidence level, and give me public speaking experience. For me, preparing this type of talk works best by starting off small and adding to it. So I started off saying, “Prostate cancer imaging is lacking. My work will improve prostate cancer imaging.” That is about 10 seconds. Then, I can add a sentence or two, and assess. I think this is MUCH easier than writing it all at once, because this way you don’t end up with perhaps 5 or 6 minutes of material. It is difficult to cut that down because you think it is all important to the talk. Julie: Thanks! I had two main reasons for doing the 3MT competition. The first reason was that it’s always great to have a short description of your research ready to talk to non-specialists. I hadn’t really worked on that before, so this forced me to develop that. The other reason is because I HATE public speaking. This seemed like a good opportunity to force myself to practice and to really focus on good public speaking skills. I’m really happy I decided to try the 3MT competition. While the preparation was frustrating, it was also really fun for me! Misagh: I think that we are doing really nice research and our goal is to eventually help some people by finding a cure or a new discovery, but that's likely in the far future. What keeps me going forward is the feeling that my struggles are seen and recognized by others. Not particularly praised but merely recognized. Plus, I am an educator and I love to challenge myself to see if I can explain complicated ideas in really simple terms. I think for me it was the combination of the desire to be recognized and the personal challenge to see if I know my research well enough to explain it simply and quickly that propelled me to do the 3MT. Siddieg: Thanks. I just wanted to share the enthusiasm that I feel about my research with others. The length of the presentation forces you to think hard about the core of your research and its significance and then consider the best way to communicate that with people who are not necessarily experts in your area. Richard: I thought that we needed someone to represent the math department in the competition! A lot of mathematical research is very abstract, and my work is a little more concrete and easy to describe, so I thought I'd give it a shot. It was tough to create a narrative that would make the material accessible to an everyday audience, and I spent a lot of time thinking of real applications for what I do. LSU College of Science: Can you tell us about your research and why it matters in a few sentences? Joe: Prostate cancer imaging has reached a bottleneck in terms of image resolution. My research aims to improve resolution in prostate cancer imaging by combining recently developed, unrelated medical technologies. Improved resolution increases image quality, which reduces the uncertainty in prostate cancer management. 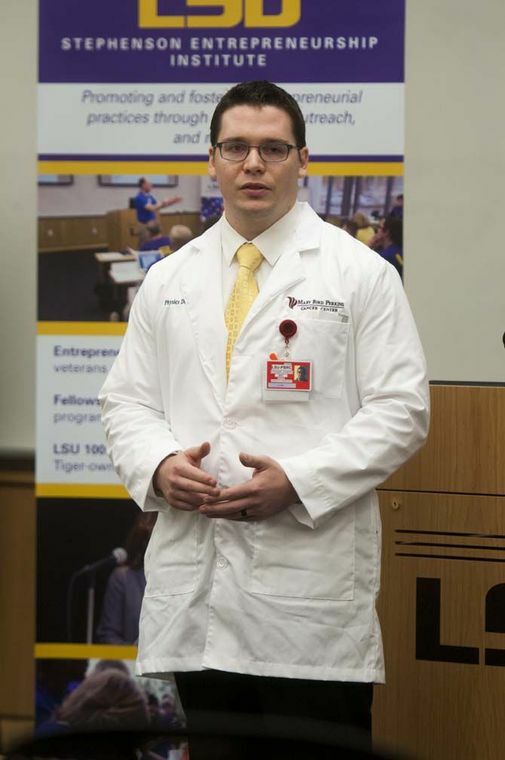 Joe’s research involves the medical physics program at LSU, Mary Bird Perkins Cancer Center, Pennington Biomedical Research Center, XDR Radiology, the LSU Biological Sciences Department, the LSU Vet School, and the LSU Office of Innovation and Technology. Julie points out her fish study organism in the lab. Julie: And I thought three minutes was hard… Increases in human activities like shipping and oil exploration have caused underwater noise levels to be over 30 times greater than they were just a few decades ago. My research examines how a noisy environment impacts fish behavior, reproduction, and communication. Because shipping and aquaculture are important to much of the coastal world, it is important to understand how fish that live in noisy environments communicate in and cope with the excess noise. Julie works with Dr. Karen Maruska. Misagh: Discovering drugs in computers to save lives. In case of rare diseases, or “Orphan diseases,” where a small population is affected, the return on investment is too small for Big Pharma to discover and develop a new drug that can take up to 15 years and billions of dollars to create. A smart work-around is to find a drug that was developed for another disease but that can help to treat an Orphan disease. This is called drug repurposing or repositioning. I'm trying to model the proteins and pathways for each Orphan disease using super computers at LSU, to see if some of our known and approved drugs can affect the proteins involved and therefore be repositioned or repurposed to treat an Orphan disease. Misagh works with Dr. Michal Brylinski and Dr. Konstantin Gus Kousoulas. Siddieg: I have prepared new platinum molecules that change color in response to heating or cooling, or when organic liquids or anions are added to them. This sensitivity allows us to use these new molecules as molecular thermometers and rapid detectors of environmentally relevant pollutants. 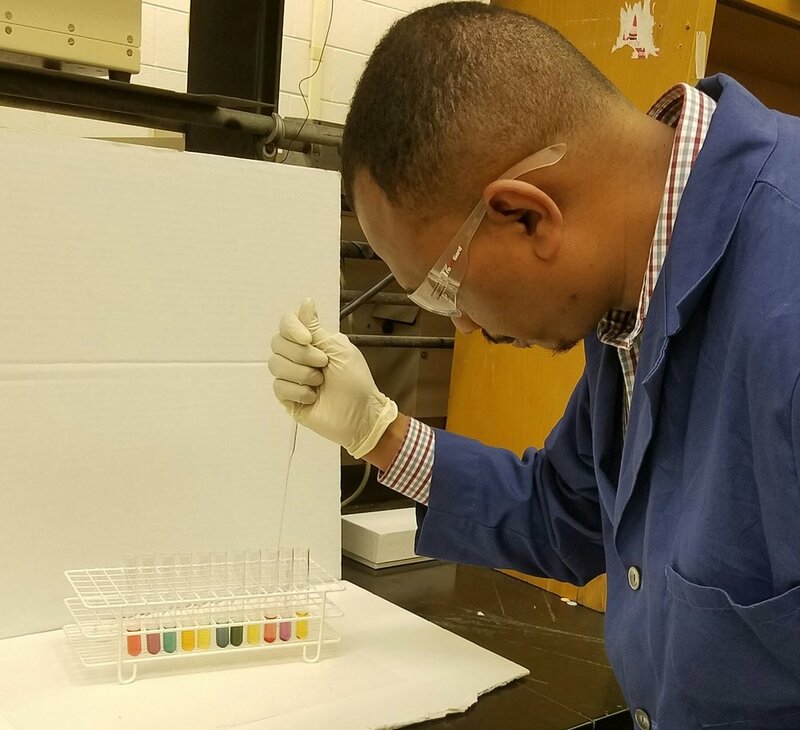 The colors are actually telling us something useful; for example, if you add nitrate (a pollutant) to a solution of one of these compounds, you immediately see a color change from yellow to green telling you that you have nitrate in the sample. Siddieg works with Dr. Andrew W. Maverick. Richard: My research involves counting these objects called “unimodal sequences,” which we refer to as “stacks,” an extension of partitions. They look like pyramids with one peak when you draw them out on paper, or you could stack blocks to make a staircase that goes up and down. As you increase the number of blocks in your staircases, the number of stacks that you can create grows exponentially. There is no nice formula involved that will tell us how many there are as the number of blocks gets really big, so we have to approximate them. Richard works with Dr. Karl Mahlburg. LSU College of Science: What do you love most about your research? What's the one "fun fact" about your research that you tell everyone? Joe: I love building things and making things work, and this is why I spent a few years working in mechanical engineering before coming to LSU for graduate work in medical physics. My project consists of developing an entirely new method of imaging using existing, unrelated medical technologies. This is incredibly interesting to me and a very good fit for my prior skill set and what I want to do in the future. I think the most “fun fact” about my research is that everything I am using already exists and is in clinical use. I am simply putting all of these things into the mixer and hoping that a new prostate imaging technique will come out, and (quite fortunately, since I am very much looking forward to graduation) everything seems to be working so far! Julie: I think the thing I love most about my research is that I feel like I am always doing and learning new things. I take an integrative approach to my research, so I get to do a variety of techniques and methods. It’s fun. And it keeps me on my toes! My ‘fun fact’ is about the model organism I use for my research, Astatotilapia burtoni. They’re mouthbrooders, so during spawning the female takes the eggs into her mouth where they’re fertilized by the male. She carries the developing fish in her mouth for ~2 weeks, during which time she starves herself. Misagh: I have bachelor's and master's degrees in chemical engineering and the only reason that I branched out to get into molecular virology research and then computational biology was to participate in research that could directly and positively affect human health. It makes me very happy to do a research project where possible outcomes, no matter how large or small, will certainly affect human health in a positive way. Working on computer modeling projects also gives me the freedom to be anywhere and do what I love to do. I can be sitting in a coffee shop in Houston while I'm on vacation to go see the Houston Symphony Orchestra or lying in my hammock somewhere by a creek in a backpacking trip and check on my work to make sure the super computers at LSU are doing what they are supposed to do correctly. My work also deals a lot with visualizing the results using amazing visualization and graphical tools, which looks a lot like what you'd normally see in science fiction and futuristic movies. 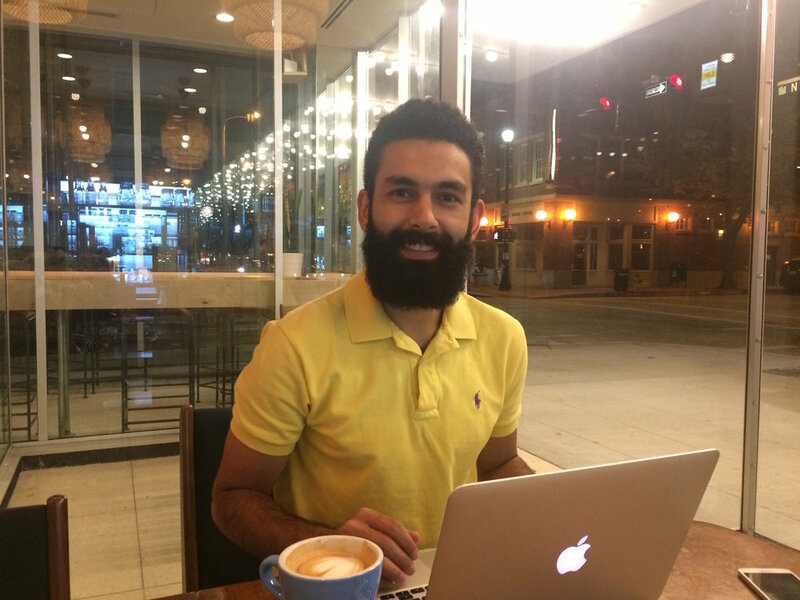 Misagh works on creating datasets from databases on Orphan diseases and FDA approved drugs from Drugbank websites during the LSU-Alabama game night at MagPie Cafe downtown Baton Rouge. "Campus is too crowded on game days so I need to grab the laptop and go to a coffeeshop! I love my research." Richard: I get to work with 'q-series', which are infinite products that have some really cool relations. The prodigious Indian mathematician Srinivasa Ramanujan was a master of manipulating these series, and he laid the foundation for this whole area. LSU College of Science: What's the most challenging aspect of your research? What aspect of your research has forced you most to "grow" as a grad student / researcher? Julie: I think the most challenging aspect of my research is when my fish won’t cooperate. I try to force them into aggressive and reproductive interactions, but sometimes they just aren’t feeling it and won’t behave appropriately. This has forced me to learn to be a little less of a control freak. It has also taught me the importance of having multiple research projects occurring at the same time. When one is frustrating or slow, I can always fall back on another one until my fish decide they want to cooperate! Misagh: The work is difficult, and it's a lot of work that needs to be done by a very small team. It's like hiking new terrain where the land is not perfectly known and sometimes you might find yourself under-equipped to go further, and there is certainly no helicopter to evacuate you in the end. You get into the research packing all you "think" you may need, by taking courses and reading books and gathering basic knowledge as much as you can. Then after a while you reach a place where you realize you’re not hiking the developed park territory anymore and it's "wild mother nature" that you're dealing with. You have to learn to build the tools you need as you move forward. That's the most difficult and the most rewarding part, where I learn to do something, a lab technique or writing a code, that needs to be done to move my research forward and is not available in the form and shape that I need. You learn to learn how to survive and then you survive, if that makes sense. Siddieg: Research requires patience and frustration tolerance. Without these, little can be accomplished. Initially, I was working with other metal ions that did not behave as expected but we eventually figured out what was going on. After that, we moved on to platinum and we got our breakthrough. LSU College of Science: Was it challenging, condensing a talk about your research project down into three minutes? How did you decide what to include, how to hook your audience, etc.? What were your "ingredients" for this competition? Julie: YES! Because I work on fish, I knew I needed a way to make my research relevant to a broad audience. I decided to use analogies to make it relatable to humans. Obviously you have to leave out ~98% of your research for a three-minute talk, so I chose the most impactful points and focused on what told the best story. For me, that meant personifying my fish (I even named him Burt!) and telling a story about him that the audience could get emotionally connected to. Hook – Here, I try to connect with the audience. Everyone knows about cancer and what a terrible disease it is, so I try to put them in the shoes of someone who is trying to figure out if he/she has cancer, only to be told that the methodologies we currently have for doing so are not that great. Significance – Here I simply answer the question of why “this” (which is prostate cancer) is a compelling problem. What are the numbers, and how can I make them relatable to the audience? Problem – Why are current methods not working? What is the overarching problem I want to solve? Intro – A simple one liner where I say who I am and what I want to do. Solution – In simple terms, talk about the solution I am developing in my graduate work. How? – Briefly discuss how I will accomplish this work and what I have already done. Closing – Restate what I want to do and the significance. Misagh: I was trying to sleep in the back seat of a shuttle bus and I just couldn't. I was coming back from an intense weekend canoeing trip in Mississippi. My body was tired but my mind was sharp from all the fresh air, the lush woods and the crisp water. I was searching for a mental activity in my mind when I remembered the 3MT competition; I imagined the slide in my mind and started collecting thoughts and ideas and placing it on the slide. That's when I realized I had a story to tell. My friend Sheryl was unfortunately in the hospital and her disease was a rare disease. Sheryl travels almost non-stop, but now a day after her 66th birthday she is not able to walk due to a disease that we haven't even heard of! I borrowed my friend's phone to use its timer app and started talking; it took me one minute to tell the story of my friend Sheryl, and I knew I could explain my research in another minute as I had done this many times in elevators and parties so I thought I actually could do a two-minute competition! Siddieg: It was a fun challenge. I had to think about the essence of my project and the best way to make the science accessible without dumbing it down. I thought starting with a problem that is easy to recognize (environmental pollution) may draw the audience in. After that, I introduced our solution for identifying pollutants through simple color changes. Richard: It was hard to condense everything down. I knew that I had to throw out all the mathematics and equations involved and get down to the core concept. Coming up with practical, everyday applications was really tough as well. That's usually not our area of expertise in mathematics, as most of the concepts we deal with are completely theoretical. LSU College of Science: What are you most looking forward to about the final presentation/competition? Joe: I am very excited to hear all of the talks. During events like this I always think “Wow! That is a great way to get that point across! How did I not think of that?” It will be a great learning opportunity in communication and public speaking. Julie: I’m looking forward to seeing the other finalists’ presentations. As grad students, we tend to get consumed in our own work, so this is a great opportunity to see the awesome research going on by peers at LSU. Misagh: To go up on the stage and be able to control my heart rate and do a perfect pitch. That's all I can think of. The competition is between me and myself. To be able to control my mind, my emotions, and my body. I am also looking forward to giving a talk that benefits the audience. We are educators after all, even if the chance is only 3 minutes long! Richard: I am looking forward to the other talks, as I only got to see a small portion of them in the preliminaries. It will also be fantastic to give a talk in the Digital Media Center, considering some of the other brilliant people that have presented there. LSU College of Science: How has communicating your research accessible to a broader audience helped you as a researcher / graduate student? Joe: There are two ways in which these types of presentations have helped me as a graduate student. The first is that these types of talks help me to refocus on the “big picture.” It is very easy to get lost in the minutia. These opportunities force to me take a step back and evaluate what I am doing. The other is that these types of presentations, particularly presentations that you must complete without the aid of notes or a lectern or slides, are incredible for building confidence and public speaking skills. Both confidence and public speaking are a huge part of becoming an effective researcher, professor, professional, team member and/or manager (or whatever else you might stumble into). Siddieg: It was a great experience because you have to ask yourself, what is my research all about and why does it matter? I felt thinking this way gives more clarity and purpose to my research. Siddieg working with his colorful detection solutions. Richard: It has helped me think about the bigger picture of where my work fits in in the real world. And now when someone asks me about my research, I can explain it to them in 3 minutes! LSU College of Science: What advice would you give other graduate students wanting to presenting their research to an audience of non-specialists? Julie: DO IT! The more people you talk to about your research, the better you’ll get at it. Joe: Don’t be afraid to fail. I personally am still trying to overcome this, and that is why I participate in things like the 3MT. I don’t want to fail, I don’t want to forget half my lines, I don’t want to trip over my own tongue. Doing anything like this in public is a very big fear of mine, and it is not fun – I know this from past experiences. But the fact is, everyone is afraid of this. The only difference between myself and an effective speaker is that the effective speaker overcame his or her fear. And to do that, they took opportunities to present and presented… and presented… and presented. That is my kind of formula to success. I didn’t need some special skillset or a degree from an Ivy League school or to be the smartest person on stage. I simply had to work hard, be passionate about my work, and take every available opportunity to present to build my confidence and overcome my fear of failure. Now, to tie this into a “non-specialist audience,” I think that the most important word in this general advice is “passionate.” If you can translate some of the passion you have for your research to a non-specialist, even if you forgot half your lines or forget how to pronounce your name, even if on paper you got last place, you have succeeded and have become that much more effective as a communicator. Misagh: Do it and do it often. In how to do it, I would say pick the most important elements of your research and what you want to achieve with it and talk about them with your friends and people you know from the coffee shop. Keep what sticks in their minds and excites them and refine what was difficult for them to understand, after a while you have a story that's interesting and understandable for a general audience. Siddieg: I think they should start by placing themselves on the other side and make very few assumptions about other peoples’ familiarity with their area of research. They should also avoid the jargon and find an angle in their research to which the audience may relate. Richard: It is a worthwhile experience for any researcher. You have to be able to communicate what you are doing to other people, no matter their background. It forces you to think outside the box and broaden your view of the subject. Attend the finals of the 3 Minute Thesis competition at LSU On Wednesday, November 9 at 6 p.m. in the Digital Media Arts Center, located at 340 East Parker Blvd on the LSU campus.